Irukandji offers incredible opportunities to encounter a world little is known about. Learn more about the animals that live there and take an in-depth look at the importance of ocean ecosystems. 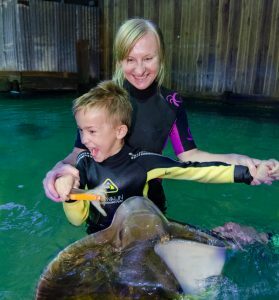 Animal encounters with many species of Sharks, Rays and sea life give you the chance to get up close and personal with these magnificent animals. Differing from the normal behind glass aquarium experience Irukandji is a one of a kind. Everybody who visits Irukandji gets a once in a lifetime opportunity to meet all the animals guided carefully by an informative tour leader. Along with meeting them, you will also get to interact with them in their world by feeding them with special feeding sticks, pat them softly on their backs and you will even get tickled and cuddled by them! Rays love cuddling. 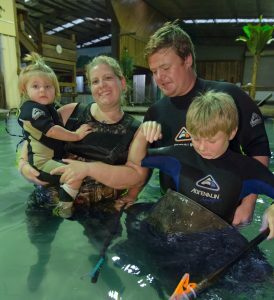 There is an encounter for any age or experience level, starting at the babies in the Aqua Nursery, all the way up to Raspy our 325kg Stingray who loves people and tells them so by sitting on their laps and cuddling them.